You’d think the Vernon Herschberger raw milk case was going to be the trial of the decade the way the prosecutors are pulling out all the stops to stack the deck in their favour with pre-trial maneuverings. But now a new factor, Vernon’s Amish faith and its relation to the legal system, has been brought into play. “At today’s (Friday) hearing, the issue was freedom and protection of religion, as guaranteed by the U.S. Constitution’s First Amendment. During one of Michael Schmidt’s trials, a Toronto Sun journalist was called to the stand to give testimony about an interview he had done with Michael just the day before. In this case, the Sun clearly didn’t want to make an issue about it. A quick call to the office to clear it with superiors seemed to be all that was needed. The request was made in that morning, and the reporter was testifying the very same afternoon. Not that it’s a practice we’d want to encourage, for all the many reason David cites in his story. Zinniker farm giving up on raw dairy? The Zinniker farm, in Wisconsin, has been one of the flagship biodynamic farms on this continent for some 70 years. They’ve been dairying for decades. It’s sad to read about their apparent defeat on the raw milk front, by agents of the DATCP, in spite of what sounds like great support from their community of customers. David has the story. Falls Church, VA, Aug. 28, 2012 ( GlobeNewswire ) – Wisconsin dairy farmer, Vernon Hershberger of Loganville, has retained the Farm-to-Consumer Legal Defense Fund (FTCLDF) to represent him in his upcoming criminal trial on four misdemeanor counts for alleged violations of the Wisconsin food and dairy code. The trial was originally supposed to take place on September 25 in Sauk County Circuit Court in Baraboo but Judge Guy Reynolds has postponed the trial until January 7. The judge has set aside five days for the trial. 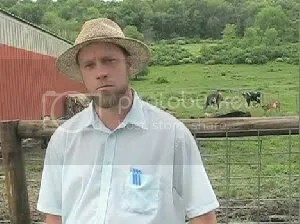 “Prosecutors seeking to jail Vernon Hershberger for distributing his farm’s food privately to members of a food club betrayed their nervousness yesterday when they filed motions intended to limit the evidence the Wisconsin farmer can present to a jury. Wisconsin raw milk farmer Vernon Herschberger. Baraboo, WI—Food sovereignty activists from around North America will meet at this tiny town on March 2 to support Wisconsin dairy farmer Vernon Hershberger and food sovereignty. Hershberger, who has a court hearing that day, is charged with four criminal misdemeanors that could land him in prison for three years with fines of over $10,000. “Wisconsin’s Attorney General has signaled his willingness to go ahead with the possibly provocative step of throwing dairy farmer Vernon Hershberger into jail.